The family Magnapinnidae was originally based on a single species, Magnapinna pacifica. However, the discovery of a second species, M. atlantica, and the realization that other known specimens and species belong in the family indicate that this poorly known deep-sea family may have as many as five species based on only eleven specimens. However, as only three of the species are well-described, and four of them are weakly separated from one another, we cannot infer yet that this is a highly speciose family. Vecchione et al. 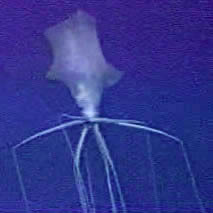 (2002) described the occurrence of a strange, large squid recorded only by submersible or ROV observations (see title photograph). The authors suggested that these squid belong in the family Magnapinnidae. With the discovery of more species, although based only on small individuals, we are now confident that these large deep-sea squid are magnapinnids, and we include them here. The title photograph shows the thicker regions of the arms and tentacles that are often held at nearly right angles to the body axis and the long, slender portions of the arms and tentacles that trail the squid and are nearly parallel to the body axis. Apparent counterparts for these regions of the arms/tentacles are present in the juveniles. For ease of description we give separate names to these two regions: the proximal-arms/tentacles and the distal-arms/tentacles. Buccal connectives attach to ventral margins of arms IV. Gladius apparently with elongate secondary conus (except in Promachoteuthidae). Absence of the "teuthoid" tentacular club. Fins terminal (often large) extending well beyond the posterior end of the muscular mantle (this feature is also present in the Lepidoteuthidae). Oval funnel-locking cartilage but without protrusions (this feature is also present in the Joubiniteuthidae and Promachoteuthidae). narrow, very elongate (vermiform) distal-arms and distal-tentacles. Arms with two regions: short, proximal-arms with large suckers and long, very slender distal-arms covered with minute suckers. Arms suckers with bi- to quadra-serial suckers on proximal-arms, multiple irregular series on distal arms. Figure. Ventral and dorsal views of the brachial crowns of M. pacifica, 51 mm ML . Drawing from Vecchione and Young (1998). The differentiation of arms from tentacles and the determination of the total number of appendages in Magnapinna videos/photographs are often difficult to determine. 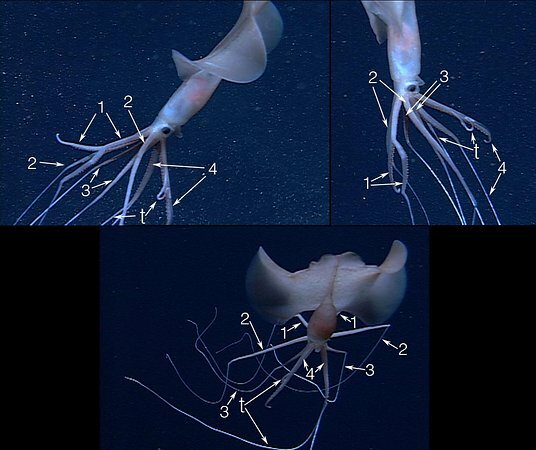 Here we have taken three frame-grabs from an MBARI ROV video taken in Hawaiian waters and labeled the arms and tentacles. This squid has the tips of the right Arm I and left arm IV and left tentacle broken off. The left arm IV has the left tentacle partially cradled in its lateral membrane and this can be recognized in all three photographs. Apparently this Magnapinna uses a lateral membrane in guiding each tentacle as in most chiroteuthids, mastigoteuthids and Joubiniteuthis. The right Arm IV shows the same cradling of the right tentacle in the top left and bottom photographs while the top right photograph shows the tentacle mostly free from Arm IV. The proximal thick portion of arms III are much shorter than in the other arms which can cause these arms to be mistaken for tentacles because of their position if the true tentacles are hidden within the lateral membranes of arms IV. Figure. 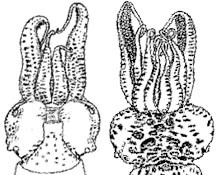 Three views of the same M. pacifica needed to identify arms and tentacles. 1-4 = arm numbers; t = tentacles. Photographed at a depth of 3376 m. © 1013 MBARI. A portion of the MBARI video from with the above images were taken is seen here. 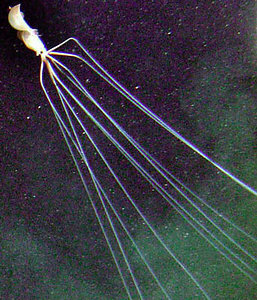 Tentacles with two regions: short, proximal-tentacles that may or may not bear numerous suckers and long, very slender distal-tentacles covered with numerous minute suckers. Tentacles without keels, terminal pads or locking apparatuses. Head short without distinct neck or brachial pillar. Funnel with oval locking-apparatus without tragus or antitragus. Fins large, ca. 70-90% of ML. Muscular mantle restricted to the anterior 10-15% of the sessile region (ie, attached region of fins that doesn't include the free anterior fin lobes) of the fins. Short tail usually present. May represent drawn-out tip of fins that have been damaged. Figure. Ventral view of Magnapinna pacifica, holotype. Note that the muscular mantle terminates in the anterior region of the fins. Photograph from Vecchione and Young (1998), modified. Most described specimens are based on paralarvae or juveniles. The adult/subadult squid, observed from submersibles or ROVs, have the following features: The arms and tentacles typically are held in an unusual position: They extend at sharp angles to the body axis then abruptly (sometimes at a 90° angle) turn anteriorly. The "elbow" is, roughly, two thirds of the length of the mantle away from the body axis. This arm posture recalls the way in which the tentacles of Mastigoteuthis spp. are held apart although with the aid of the ventral arms. Rough estimates from videos indicate total lengths up to 7 m (Vecchione, et al, 2001). Arms and tentacles are approximately equal in thickness and length. The tentacles are usually not easily recognizable in videos; the arms and tentacles, therefore, appear as 10 equal appendages. Length of the arms/tentacles of the squid pictured below are about 10 times the ML although they are highly contractile. Guerra et al (2002) estimated that an individual they observed had arms/tentacles about 15-20 times the ML. The relative length of the arms/tentacles is far greater than in any other squid. The head appears to be small. Fin Length of the specimen pictured below is about 80% of the ML. Guerra et al (2002) estimated the fin length of their specimen at about two thirds of the ML. The fin position is terminal. Figure. In-situ images of Magnapinna sp., Gulf of Mexico. Left - Side view showing long appendages. Right - Dorsal view showing common posture with proximal-arms/tentacles at nearly right angles to the body axis. Video frames of taken by DSV Alvin, Woods Hole Oceanographic Institution. Dives co-sponsored by NOAA Undersea Research Program, Minerals Management Service and National Energy Technology Lab. Due to the poor condition of the single specimens of Magnapinna spp. B and C and M. talismani, our present understanding of the species in the family may be flawed. M. atlantica, M. talismani and Magnapinna sp. C could belong to the same species. 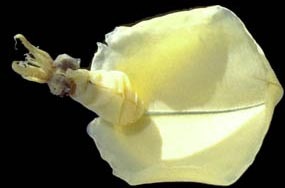 The feature that most clearly separates M. atlantica is the presence of glandular structures on the proximal-tentacles. The recent discovery that these structures become relatively smaller with size and are easily lost due to damage indicates that these structures may have been lost in M. talismani and Magnapinna spp. B and C. Magnapinna sp. B, however, appears to differ from the others in the longer free-of-the-fin mantle and the broader orifices of the proximal-arm suckers. A list of all nominal genera and species in the Magnapinnidae can be found here. The list includes the status and type species of all genera, and the status, type repository and type locality of all species and all pertinent references. A paralarval stage is known for Magnapinna pacifica. Geographical distribution: Magnapinnids are probably found, at least in temperate to tropical latitudes, throughout the world's oceans. Vertical distribution: Most magnapinnids have been photographed within a few meters of the bottom at great depths. The following photograph shows a small magnapinnid swimming just above the ocean floor at 4708 m in the Kermadec Trench. This squid appears to be under 100 mm in ML judging from the cross bar which shows a 100 mm distance between black tapes. Although the resolution is insufficient to be certain, the squid appears to not yet have the full development of the slender distal arms. Figure. Magnapinna (arrow) photographed by a deployed camera monitoring fish-bait. © Timothy M. Shank, Woods Hole Oceanographic Institution. The deepest record for a squid is 4735 m which was another magnapinnid photographed in the western Atlantic off Brazil (Vecchione, et al., 2001). Guerra, A., Gonzalez, A. F., Rocha, F., Segonzac, M., Gracia, J. 2002. 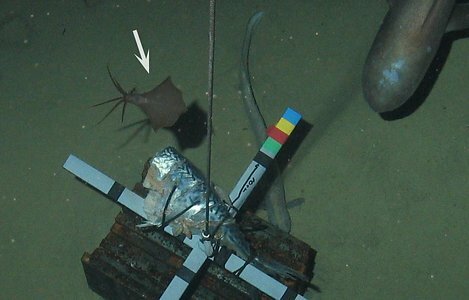 Observations from submersibles of rare long-arm bathypelagic squids. Sarsiae 87:189-192. Vecchione, M., Young R. E. 1998. The Magnapinnidae, a newly discovered family of oceanic squid (Cephalopoda: Oegopsida). South African Journal of Marine Science, 20:429-437. Vecchione, M., R.E. Young, A. Guerra, D.J. Lindsay, D.A. Clague, J.M. Bernhard, W.W. Sager, A.F. Gonzalez, F.J. Rocha, and M. Segonzac. 2001. Worldwide observations of remarkable deep-sea squids. Science 294: 2505-2506. Vecchione, M. and R. E. Young. 2006. The squid family Magnapinnidae (Mollusca; Cephalopoda) in the North Atlantic with a description of Magnapinna atlantica, n. sp. Proc. Biol. Soc. Wash. 119 (3): 365-372. Alien-like Squid With "Elbows" Filmed at Drilling Site. National Geographic video & pictures. © NOAA Undersea Research Program, Minerals Management Service and National Energy Technology Lab. Page: Tree of Life Magnapinnidae Vecchione and Young, 1998. Magnapinna Vecchione and Young, 1998. 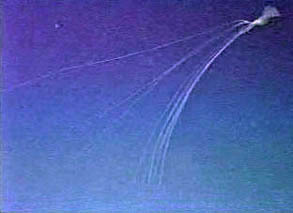 Bigfin squid. Authored by Michael Vecchione and Richard E. Young. The TEXT of this page is licensed under the Creative Commons Attribution-NonCommercial License - Version 3.0. Note that images and other media featured on this page are each governed by their own license, and they may or may not be available for reuse. Click on an image or a media link to access the media data window, which provides the relevant licensing information. For the general terms and conditions of ToL material reuse and redistribution, please see the Tree of Life Copyright Policies.